10mm (from hole to hole) x 12mm (wide) "three-petal" deep flowers with the hole through the middle. They are called 3-petal flowers because the outer rim of the flower has 3 raised, rounded areas. There are also 2 grooves on the outside of each "petal". 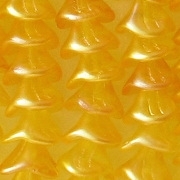 Glass beads, probably yellow, with a synthetic satiny yellow coating. (If the inner bead were clear, I don't think the yellow color would be nearly so intense.) I don't know how durable the coating is. The beads appear to be in good shape, although some beads may be chipped. If you receive chipped beads, please contact me for a partial refund. As is always the case, there is some roughness in the center of the flower, in the depression around the hole. Czech synthetic coatings are getting more and more sophisticated. They used to feel like plastic to the fingers, but now they are hard and feel like glass. However, as I said above, I have no idea how durable the coatings are. It's possible that the coatings may help protect the glass from chipping. 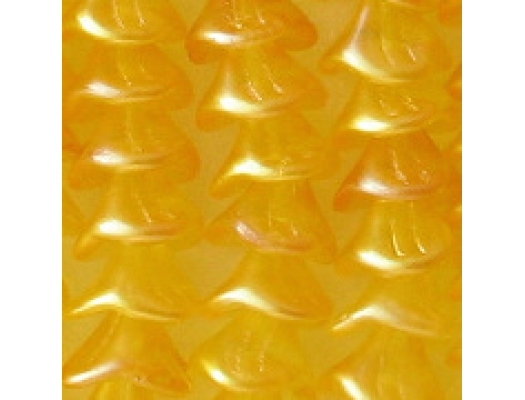 The supplier's picture makes the beads look a lighter yellow. My picture is more accurate: These beads are such a deep yellow that they verge on orange. However, it's possible that my picture is a bit too dark. 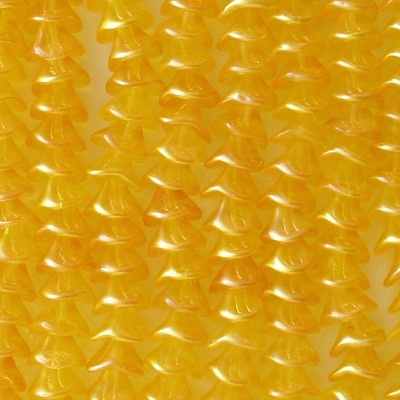 About the price: The supplier's price for large 3-petal beads is going up. Clearly they are desirable beads, since they usually sell out quickly. To keep the per-lot price down, I really should sell them in lots of 20. But they come on strands of 25 beads, and it is just too easy to pull 25 off a strand instead of counting out lots of 20.